This recording is a fine example why I have come to love the work of Gil Rose and his Boston Modern Orchestra Project. The scope of his musical choices ranges from intelligently selected new music projects by living composers and a fabulous survey of music by older composers that he considers worthy of attention again (and sometimes for the first time). All BMOP recordings (even those on other labels) are consistently of the highest quality and the performances are definitive. This series now on the orchestra’s own label is rapidly becoming a sort of canon defining modern music, or at least one vital vision of it. There appear to be only two other recordings of this masterwork. The first is a cobbled together mono version released on RCA with the composer conducting most of it and Leopold Stokowski conducting some numbers in this abridged performance. The second is the very fine 1981 version by the Orchestra of Our Time under the able direction of Joel Thome. The differences between these recordings is far less important than the fact that we now have three versions of this American operatic masterpiece for our listening enjoyment. The BMOP recording is up to their usual high standards with wonderful sound and fine interpretation and musicianship. This 1934 opera premiered in Hartford, Connecticut and then opened on Broadway (yes, in New York) with an all black cast and ran for a record 48 performances. Black music pioneer Eva Jessye conducted her choir and the production was directed by a young John Houseman who had just begun to turn his talents to the theater. The libretto is by Gertrude Stein who later collaborated with Thomson on The Mother of Us All. Her word play is more about sound than grammar (or mathematics for that matter). It is in four acts and features more than four saints. The music is classic Americana with the essences of folk musics and spirituals. This is a gorgeous and fun piece which deserves to be in the canon of great American operas. Want to make America great and celebrate Black History Month? Then grab this recording and sit back for a wonderful listening experience. 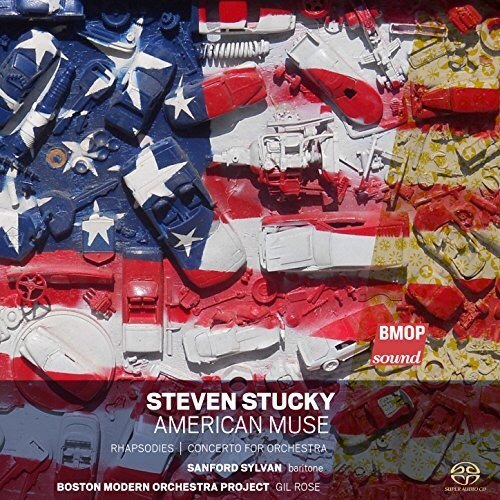 The spirit of jazz and, in particular, that of Duke Ellington and perhaps George Gershwin seem ever present in this recent release from the Boston Modern Orchestra Project. David Rakowski (1958- ) is a new voice to these ears but clearly a highly developed one well schooled in writing for large orchestra and for piano solo within that context as well. Two works are presented here, the four movement Stolen Moments (2008/2010) and Piano Concerto No.2 (2011). Both are large, colorful works in a basically tonal/romantic context but with clear modernist influence. Nothing experimental here, just sumptuous orchestral writing and a challenging and interesting work for piano and orchestra. 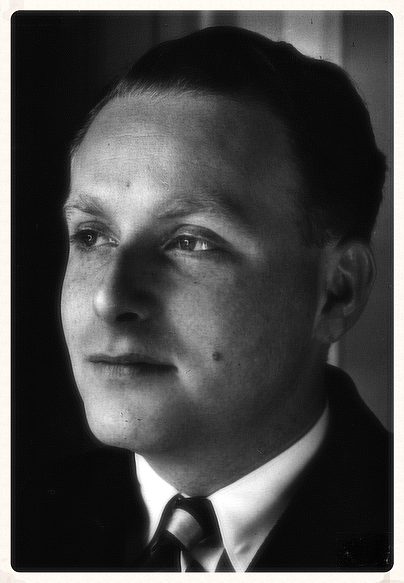 It was only from reading the useful liner notes that I learned Rakowski had been a student of Milton Babbitt (1916-2011), a composer famous for his hard nosed complexity. In fact Rakowski actually quotes from Babbitt and this music is a tribute to the education received from this man (keep in mind that Babbitt also taught harmony to Stephen Sondheim). It is as difficult to grasp that Rakowski was taught by Babbitt as it is to believe that, by his own assertion, he knows very little about jazz. The first work seems to channel the spirits of Duke Ellington and George Gershwin more than Babbitt for sure. This four movement orchestral suite, in it’s many moods, is melodic, jazzy and engaging in a way that can’t fail to entertain. Amy Briggs has long been a collaborator with Rakowski and is an artist who has successfully made her career exclusively playing contemporary music. This second of Rakowski’s concertos for this instrument was written for her and she plays it magnificently. She clearly has a feel for the jazz rhythms and handles the virtuosic writing as though it were second nature. The concerto ventures into a variety of moods and provides ample opportunities for many BMOP soloists to have their moments. It is basically a classical three movement structure with multiple subdivisions within each movement. These large movements come in at nearly 15 minutes each and are practically works unto themselves though they clearly adhere to the same basic vision. The second movement is dedicated in memory of Rakowski’s teacher Milton Babbitt. I’m sure he would have approved. This is in fact the second time that Gil Rose and his massively talented musicians have chosen to survey some of Rakowski’s music. That alone should be enough to clue listeners in to a potentially good listen. Rose has been amassing a catalog of music by modern composers whose work deserves attention and, while this is an example of some pretty recent music, Rose and BMOP have done a fine job of giving attention to composers who have been unjustly neglected as well. They seem to have a fine ear for quality music and this reviewer will listen to anything they choose to record. As usual with BMOP, the recording is bright and lucid allowing the listener to hear the fantastic details in these big and intricate but entertaining works. The production is by Gil Rose himself with recording and post-production by Joel Gordon. Another great volume in the growing BMOP canon. 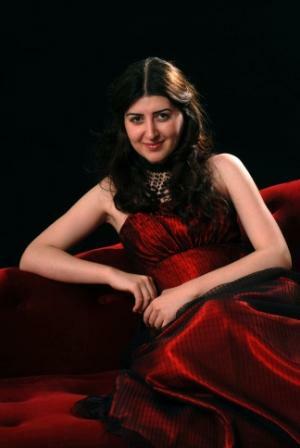 ADDENDUM: Unfortunately the pianist Nareh Arghamanyan will not be able to perform. BMOP informs me that they are substituting a piece by the wonder.ful Israeli composer Betty Olivero called Neharot Neharot (2006-7) for two string orchestras, accordion, percussion, tape and viola. It will feature none other than violist extraordinaire Kim Kashkashian. The Boston Modern Orchestra Project begins it 20th season on Sunday October 18th with a concert in honor of the 1915 Armenian genocide with a celebration of that country’s artistic heritage. Titled Resilient Voices 1915-2015, the concert will feature works by Komitas (1869-1935), Alan Hovhaness (1911-2000), Dmitri Shostakovich (1906-1975) and Tigran Mansurian (1939- ). Komitas, born Soghomon Soghomonian, is generally regarded as the foundational composer for Armenian classical music in the 20th and 21st centuries. Like Bartok and Kodaly, he collected and transcribed folk music from his country. He is considered an early founder of the practice of ethnomusicology collecting Armenian and Kurdish folk music. 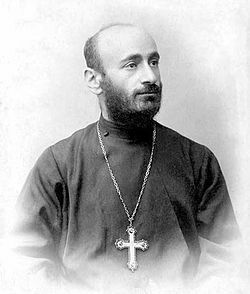 He was ordained a priest in the Armenian rite church and took the name Komitas. The impact of the genocide affected him deeply and he spent the last 20 years of his life in a psychiatric facility where he died in 1935. 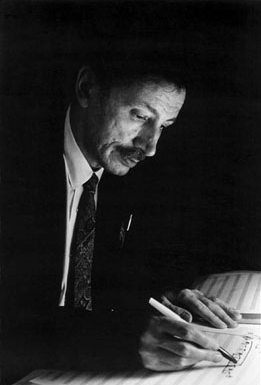 American composer Alan Hovhaness also embraced a musicological approach to his composition by including Armenian folk songs and that of other musical cultures he had explored including Korean and South Asian. He also acknowledges a debt to Komitas (Hovhaness released a recording on his own Poseidon label of him performing Komitas’ complete piano music). Hovhaness remains less well-represented than he deserves in the concert hall so this performance of Khrimian Hairig (1944, rev 1948) is a welcome one. The piece is in three continuous movements titled, “Chalice of Holiness”, “Wings of Compassion” and “Triumph of Faith”. It is scored for string orchestra with solo trumpet. The solo here will be played by prominent new music trumpeter Terry Everson (whose talents are to be required in the next piece on the program). Hairig was a prominent Armenian cleric and mystic of the 19th century. This work is early in Hovhaness’ prolific output and is characteristic of his Armenian period utilizing Armenian folk melodies and writing on Armenian themes. He would later gain wider fame when Leopold Stokowski premiered his 2nd Symphony “Mysterious Mountain” in 1955 on NBC television. Hovhaness died in 2001 leaving over 400 compositions of which 67 are symphonies. The Armenian connection to the next piece is apparently the BMOP début of the young Armenian pianist, Nareh Arghamanyan (1989- ) in the First Piano Concerto Op. 35 (1933) of Dmitri Shostakovich. This unusual piece is scored for piano, string orchestra and trumpet (I told you Everson would be back). It is one of those neo-baroque experiments and quotes from well-known classical pieces. It is quite challenge for a pianist and the début of this rising artist will doubtless be one of the highlights of the concert. The title of the concert is Resilient Voices 1915-2015 and is given in commemoration of the Armenian Genocide (1915-1923) but more so in celebration of the voices and the talents that have endured. Controversy remains evidenced by the fact that Azerbaijan and Turkey continue to deny the genocide but the estimated death toll was 1.5 million and this is the event for which the term “genocide” was first used. It is the genius of Gil Rose, conductor and artistic director whose creative vision in a couple of releases I recently reviewed ( Anthony Davis and Irving Fine) that first alerted me to the work of this fine ensemble (a little late, I know). But I discovered a great orchestra with some of the most innovative programming with attention to new and recent music. I was graciously offered a seat at this concert but it will have to be one of my regrets. This sounds like a fantastic program. 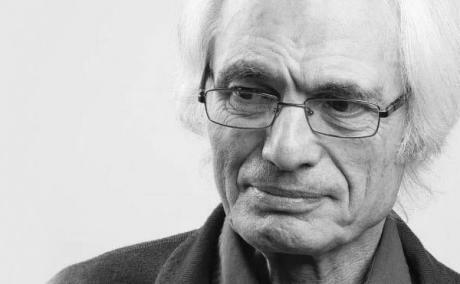 How very appropriate then to have the BMOP premiere of the Requiem (2009) by Tigran Mansurian (1930- ) by far Armenia’s best known living composer. The Requiem was written in memory of the holocaust and is scored for large orchestra, chorus and soprano and baritone soloists (not announced when last I checked yesterday). Gil Rose conducts the Harvard-Radcliffe Collegium Musicum with the Boston University Marsh Chapel Choir. This is indeed a species of political music and BMOP is to be applauded for this as a contribution to the recognition of human rights. through music. 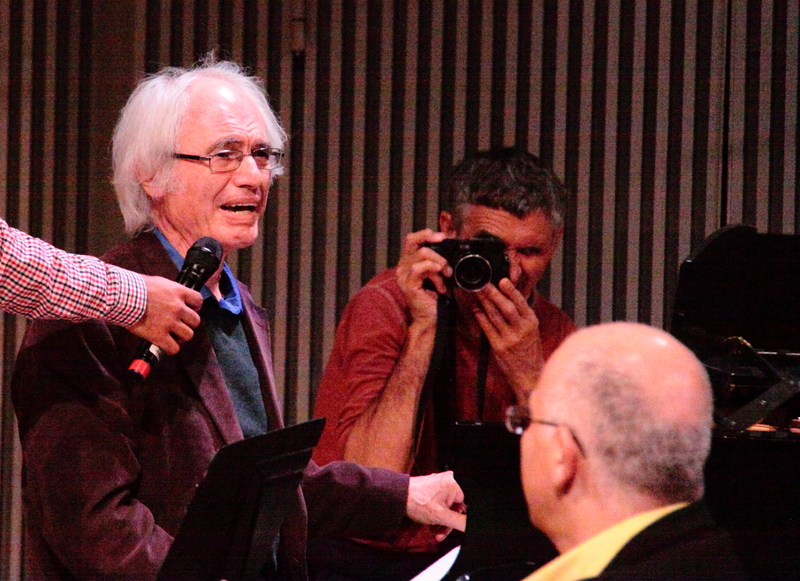 Tigran Mansurian at the piano at Other Minds in San Francisco. Mansurian previously appeared at the Other Minds 20th Anniversary concert (also dedicated to the holocaust) in March of 2015 in San Francisco. At that concert I captured a moment from the pre-concert discussion in which Mansurian agreed to sing a traditional Armenian song accompanying himself at the piano, a very personal moment from a composer whose art is deeply felt. Please, BMOP, record this. Thanks in advance!!! In March, 2014 the Boston Modern Orchestra Project released Notes From the Underground, a major retrospective recording of the composer’s work for large ensembles. 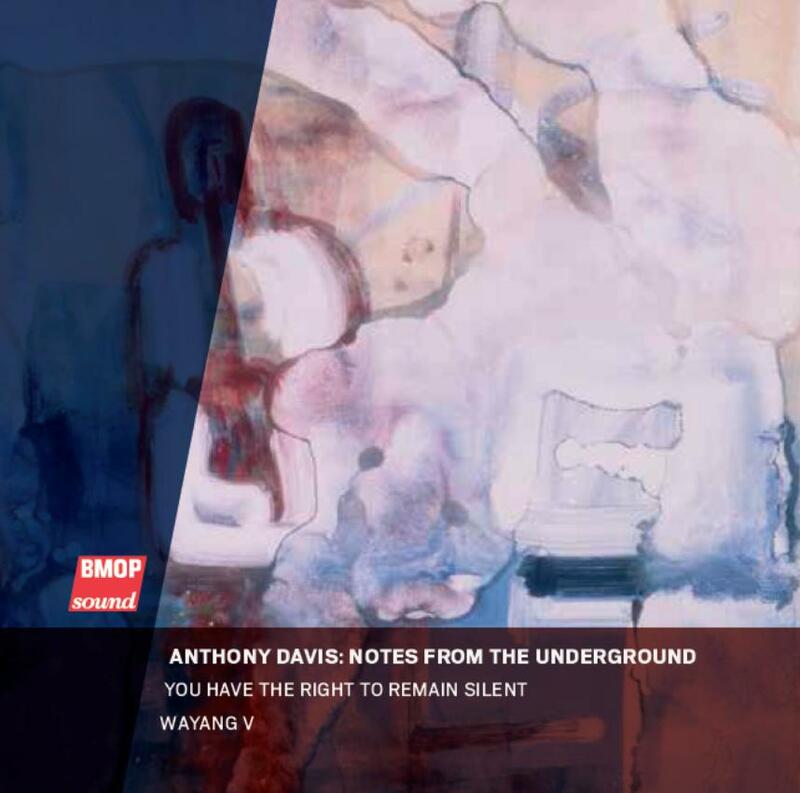 The recording includes Notes from the Underground (1988) a two movement work for orchestra, You Have the Right to Remain Silent (2007) a concerto for clarinet and contra-alto clarinet and Kurzweil processor and a new recording of the piano concerto Wayang No. 5 (1984) with the composer as soloist. 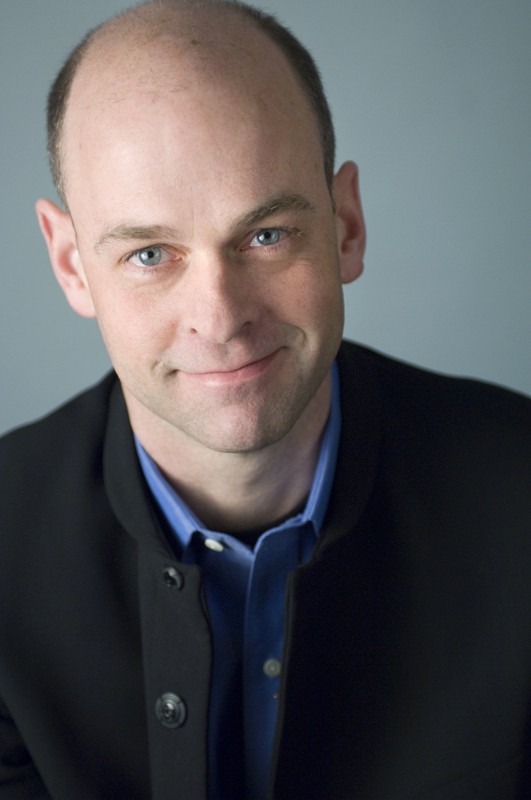 The Boston Modern Orchestra Project is conducted by Gil Rose. There are liner notes by the composer and also by the great musician/composer/historian George Lewis (and a frequent musical collaborator with Davis). The notes are relatively brief but contain a wealth of information and provide useful insights into both the musical processes and the sociopolitical forces that drive Davis’ music. Davis describes his compositional processes and Lewis, a frequent musical collaborator, places the music in historic and sociopolitical contexts. Only the Wayang No. 5 has had a previous recording. It was one of the two works included on the Gramavision release which included the equally engaging Violin Concerto “Maps” (1988) written for and performed by violinist Shem Guibbory. The concerto reflects Davis’ interest in jazz as well as his study of gamelan music from whence comes the title “Wayang”. Davis has written a series of compositions for various combinations of instruments titled sequentially Wayang No. 1, No. 2, etc. The term refers to the shadow puppet theater of Bali which are accompanied by a gamelan orchestra, an ensemble largely of tuned gongs and other percussion instruments. Davis studied gamelan music and wrote six compositions (so far) titled Wayang of which the fifth is the piano concerto on this recording. Wayang No. V is the earliest composition on the disc and consists of four movements. Opening-Dance begins with an improvisatory section with the pianist playing over unresolved harmonies in the orchestra which then leads to the main section of the movement which is characterized by ostinati in the orchestra as well as on the piano. There is a seamless transition to the second movement Undine, a slow movement with an impressionistic feel. March also begins without pause from the previous movement. It is a scherzo like piece where the polyrhythmic structures are quite clear. The finale, Keçak, a reference to the monkey chant in the ritual enactment of a scene from the Ramayana where the monkey-like Vanara help Prince Rama fight the evil King Ravana. It begins with a long solo piano introduction followed by a sort of dialog between the piano and several percussion instruments. Davis demonstrates his virtuosity here in writing that is indebted as much to gamelan as it is to jazz and modernism from Schoenberg to Bartok, Stravinsky, Hans Werner Henze and Thelonius Monk. This is a concerto that is more concerned more with expression than empty virtuosity though the piano part could hardly be called easy. I am amazed that there have been no pianists who have added this wonderful piece to their repertory. It is a very entertaining piece of music making. The title track is the orchestral composition, Notes from the Underground (1988). It is a two movement work dedicated to the writer Ralph Ellison (1914-1994), best known for his National Book Award winning novel The Invisible Man (1952). The title evokes Dostoevsky’s existential 1864 novel as well as Ellison’s collection of essays, Shadow and Act (1964). The composer describes it as a “riff” on Duke Ellington’s Diminuendo and Crescendo in Blue (1937). It is, to this listener, a grand set of orchestral variations. The first movement, Shadow, is described by the composer as one that introduces fragments which will be heard in the second movement. It features a prominent solo for the percussionist. The second movement, Act is the longer of the two and is described as being written in ten steps with an elaborate polyrhythmic structures described in more detail in the accompanying notes. The writing here probably comes as close to minimalist or process music as anything the composer has done. It is not minimalism per se but it is perhaps proto-minimalist techniques whose roots are at least partly in jazz as musicologist Robert Fink suggests. It produces a ritualistic and meditative feel to this richly orchestrated, reverent and mysterious sounding piece. It is a fitting tribute to a great American man of letters as well as to the great composer Duke Ellington. The concerto, You Have the Right to Remain Silent (2007) is the most recent as well as the most overtly political piece on the album and it is a gem. It is written for clarinet doubling alto clarinet and a Kurzweil synthesizer/sampler and orchestra. Longtime collaborator, the wonderful J. D. Parran plays the clarinets winding his way through a balanced hybrid of styles including bebop, modern classical and free jazz styles comprising rhythmic complexity and multiphonics. One could hardly imagine a soloist better suited for this music. Earl Howard plays the Kurzweil which intones sampled speech of words from the Miranda Rights which are supposed to be presented at the time of an arrest. Here they are presented strategically in poetic dialogue with the music controlled by the keyboard player. Here again the individual movements have their own titles poetically referencing the issues which the composer attempts to invoke in this piece. He says in his notes, “I tried to approach ‘silence’ as, rather than John Cage’s apolitical world of ‘white privilege’, a much more dangerous place.” The first, Interrogation, is intended to evoke the clarinet as being interrogated by the orchestra. The second, Loss features an improvised duet between the Kurzweil and the clarinet. It ends with an homage to Charles Mingus, a major influence on Davis. The third, Incarceration includes more text from the Miranda and the Kurzweil processes both the words and the clarinet solo. And finally, Dance of the Other, intending to evoke the fantasy and the feeling of otherness and presumably alienation. It is a concerto in the classical sense of a dialogue between soloist and orchestra and it seamlessly blends various classical and jazz harmonies and techniques which challenge the expertise of the soloist. All the while it clearly presents a political context which meditates on the inhumanities and inequalities inherent in our “correctional” system and in our society as a whole. As political music it lies within a grand tradition taking a place beside earlier masterpieces of that genre like Henze’s Essay on Pigs (1968) and Rzewski’s Coming Together (1971). And as a concerto it is a challenge to the soloist and a delight to the listener. This is a wonderful disc, well recorded and performed. It presents some amazing and substantial music by one of the living treasures of American composers. Anthony Davis has had a long and influential presence on the American music scene in his jazz performances as well as his chamber and orchestral music. His operas like X: The Life and Times of Malcolm X (1986), Amistad(1997 ) and the more recent Wakonda’s Dream (2007) have been performed to critical acclaim. Hopefully this recording will introduce people to this composer’s works and remind those already familiar with the power and depth of Davis’ music. 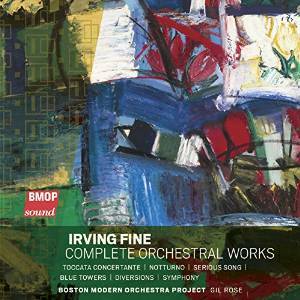 Bravo to the Boston Modern Orchestra Project for bringing this music to the listening public. I hope the major orchestras and theaters and recording companies are paying attention so we can hear more from this still too little known composer.